Are you using testimonials in your marketing? If not, you’re missing out on a powerful tool that could boost your income. One reason people buy your products and services is because they know other people have used them and liked them. That’s called social proof, and it includes testimonials. Use testimonials on your sales pages, landing pages and even within email marketing, and they’ll help persuade visitors and subscribers to become customers. But many people don’t know how to ask for testimonials so that they get quality customer endorsements they can use for marketing. That’s why we’ve asked four experts with great testimonials of their own to share their tactics on the best way to ask for a testimonial. 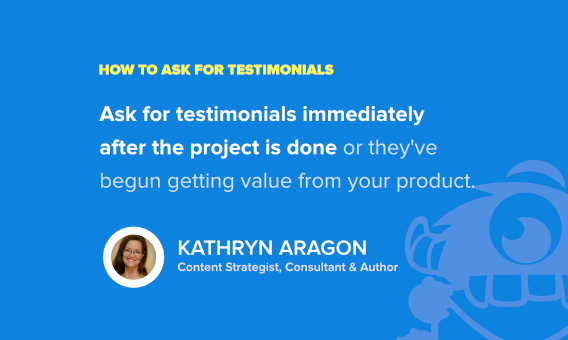 Kathryn Aragon: Getting good customer testimonials is about two things: delivering value before you ask and then timing your request. If you’ve over-delivered on value, offering a service or product that truly solves their problems, providing stellar customer service, and making customers feel like you’re there for them (and not the other way around), they’re usually happy to give you a good testimonial. But you need to ask for testimonials immediately after the project is done (for service providers) or they’ve begun getting value from your product (for apps and physical products). Gael Breton: When you sell training or software, testimonials are a key component of the business, so you bet we have worked on collecting testimonials as well as we could. There are several points inside a customer’s journey when we ask for testimonials. The first one is 30 days after the purchase. An email goes out asking people for feedback with smiley faces. If they click the smiley one, we prompt them to write a short testimonial we can use for commercial purposes. If they do send a written one, we offer them a free upgrade if they record a video talking about their experience. Incentivizing has proven very effective for us and, in the case of software and information, most upgrades have a $0 marginal cost, so it’s a win win. Gael Breton is the founder of Authority Hacker, the place to learn how to build ethical authority publishing businesses without B.S. Authority Hacker also field tests most popular marketing tools in real life. Gael Breton: In case a customer does not click the smiley face when we ask them for feedback, they are redirected to a customer service person doing everything they can to make their experience positive. After we have tentatively resolved their issue, they will then receive an email 2 weeks later asking if they’d like to share their experience. These testimonials are often the best because our customer service went above and beyond to make it right which tends to make people feel very happy. 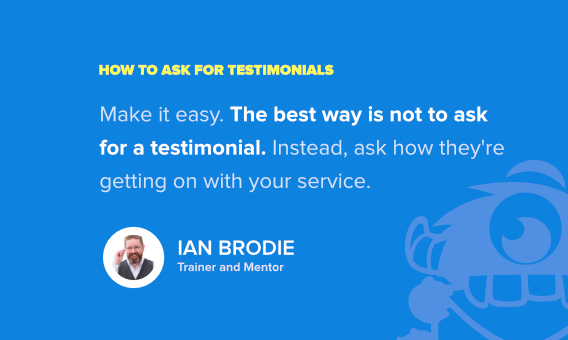 Ian Brodie: Make it really easy for people to give you a testimonial. Often the best way to do that is a technique I learned from customer success expert Lincoln Murphy and it’s to not ask for a testimonial. The problem with asking for testimonials is it puts pressure on people to come up with something word perfect, so they freeze and do nothing. Instead, ask how they’re getting on with your product or service, then when they reply in a positive way, ask for more details and ask what results they’re getting from it. Then summarize what they’ve said back to them and ask if you can use it as a testimonial. In that way you make it super easy for people to give you a testimonial. And if their first response isn’t positive, it gives you a chance to fix the problems they’re having. Ian Brodie helps consultants, coaches and other professionals to attract and win more clients – even if they’re not naturals at marketing and sales and don’t want to spend all their time marketing. 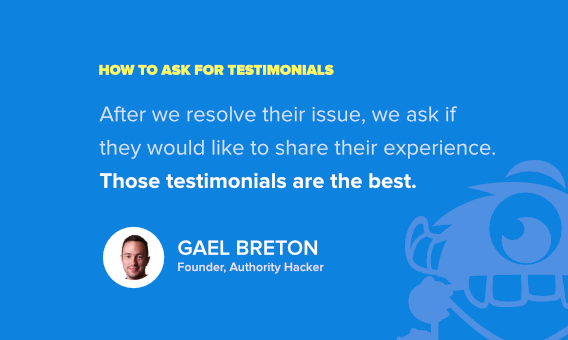 Learn how to ask for testimonials in his Ultimate Guide to Getting More Customer Reviews and Testimonials. 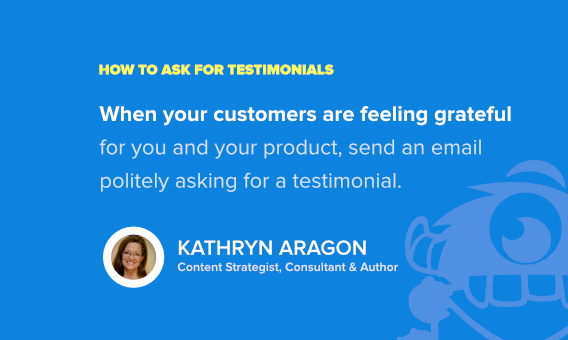 Kathryn Aragon: Find the moment when your customers are feeling grateful for you and your product, then send an email politely asking for a testimonial. If you don’t hear back, follow up with a reminder and an offer to draft a blurb that they can edit. Don’t pester, though. If you don’t get an answer to your follow-up, move on. You can ask again if they make another purchase or you work together on a second project. 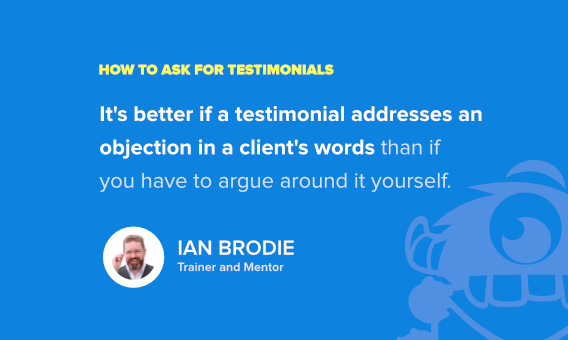 Ian Brodie: Get a testimonial that helps you sell. That typically means asking questions that focus on the results and benefits people get from your products and services, and on pre-empting any typical objections clients might have. So, if your clients are typically worried that your solution might take too much time, specifically ask about how much time it took when you get feedback for a testimonial. It’s much better if a testimonial addresses an objection in a client’s words than if you have to argue around it yourself. Jon Nastor agrees that the questions you ask are important. 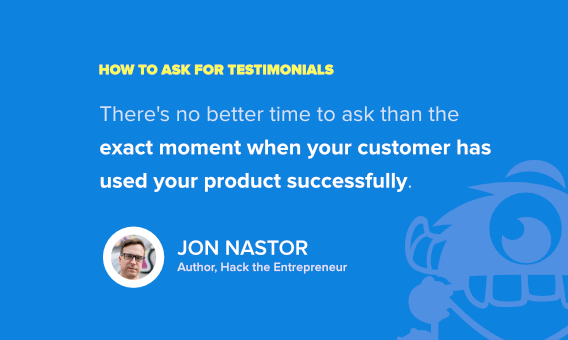 Jon Nastor: Every product, service, and course needs testimonials. As creators, it is our job to ask for them. If you don’t ask you don’t get, so I make it a point of habit to ask. Over the years, I’ve found no better time to ask than at the moment of activation or transformation – the exact moment when your client has used your product successfully. What was your biggest hurdle when purchasing? How would you explain this product (and what it does) to a friend? From these three questions, I learn where clients are falling off in the buying cycle, what the product does for the customer (in their own words), and then I receive my testimonial. Jon Nastor is the author of Hack the Entrepreneur: How to Stop Procrastinating, Build a Business, and Do Work That Matters. He is also the host of theHack the Entrepreneur podcast. With these expert tips, you know how to ask for testimonials that’ll make it easier for you to market your business. If you need more inspiration, check out our collection of customer testimonial examples. And don’t forget to follow us on Twitter and Facebook for more expert roundups and in-depth guides. I’ve found that yes starting by asking “what some positive results that you got” then seeing it, and THEN asking, can I use this as a testimonial, gets folks faster and easier. Otherwise they often overthink and get stiff in writing a “testimonial.”LOL. When I ask one of my clients in my healing practices I also choose the ones of course who are very positive and warm. Some clients work with you but just are not “recommender’s,” Ive found. Thanks for sharing your experience, Kala. 🙂 You might find some more options for getting testimonials in our article on collecting customer feedback on your website.